An update?? Here? Oh Wow! The Devil Boogie Man Skullbrain is still available (as of 5-3-09) @ www.super7store.com Just search for "hello pike" ( with a space). 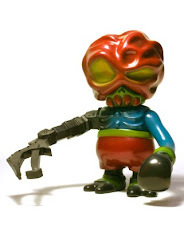 There's been some sadness lately- Kaiju-Taro isn't shipping V-color to the USA anymore... So the following group has been my farewell to v-color. I'll be painting until I run out, painting some things that I've always wanted to paint... hopefully. Sayonara V-color. These two were paited for the ICFSB show, but didn't make the final cut- The Barbarian has found a new home, but the Rangeas is available if anyone is interested! Well, thats it for now. Drop me a line is anything catches your eye. Take Care!